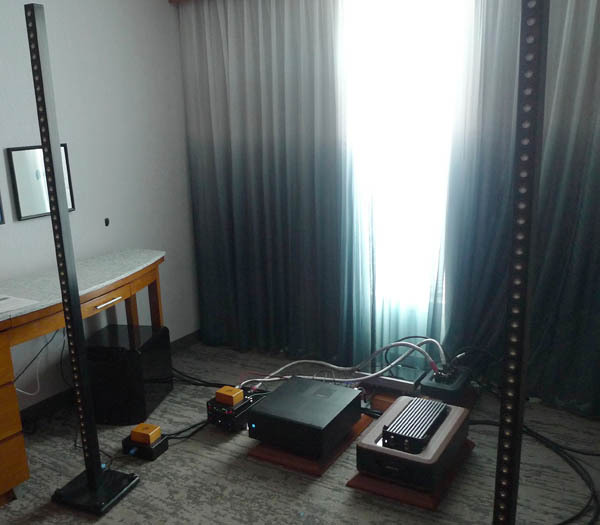 The new (world premiere) Laufer Teknik The Note loudspeakers ($29,950/pair) are very hard to photograph because they are very thin line arrays comprised of 48 little metal drivers each in a 87″-tall, 2.5″ deep, 2″-wide aluminum enclosure that’s heated—it is warm to the touch. They disappeared into space while I listened. Their soundstage went out through the wall behind them while the $1600 SVS SP-4000 subwoofer pushed tight bass down through the floor to the basement. Bach’s Toccata and Fugue in D minor rattled the walls, but I couldn’t “see” the speakers. Think: Skinny speakers make giant sound.